Welcome back! I hope you had a wonderful Thanksgiving and survived the official start of the Christmas shopping frenzy. 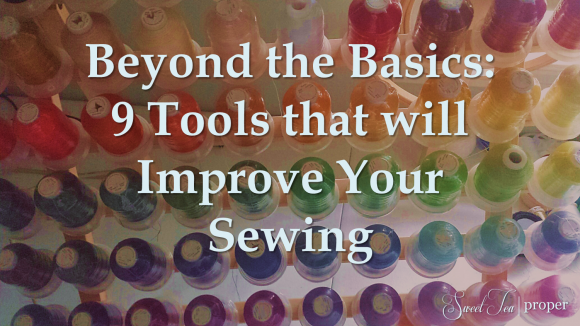 Last week we gave you our list of the most useful items to have in your basic sewing toolbox. This list is a great starting point for those who are new to sewing and want to have the essential items on hand for a variety of projects. Once you’ve decided that you are serious about your sewing hobby, it is helpful to increase your toolbox beyond the basics. The 9 sewing tools listed here will not only improve the look of your project, but will save you time and money in the long run. *This post contains referral links. If you purchase something through one of these links, this site will receive some form of compensation which helps us bring you more fun posts like this one! In the south, we are notorious for monogramming everything – clothing, hand towels, pillows – you name it. We love a good monogram and a lovely embroidery design is pretty much a staple when I’m making something for Cecilia. A monogram alone will usually cost somewhere around $9 per item if taken to a clothing shop. I used to think this was extremely expensive, until I priced a commercial grade monogramming machine. If you have ever watched one in action, these things are awesome, but out of reach for most. Luckily, you can now purchase a home embroidery machine for a fraction of the cost. With a 4×4 embroidery area, the Brother HE1 embroidery machine will take care of most of your monogramming needs. If you plan on sewing clothes, a serger will be your best friend. It will transform your homemade outfits into professional looking garments. Although you can finish a seam with your sewing machine, the quality edges produced by a serger are top-notch. Add in the time you will save as it trims the edges while simultaneously finishing them and you’ll be wondering why you didn’t invest in one sooner. I use the Brother 1034 serger and don’t have any complaints thus far. The more you sew, the more likely you will need an assortment of bobbins. The sidewinder serves one purpose – to wind bobbins. Sure, you can do it with your sewing machine, but this compact and portable machine allows you to quickly whip out a bobbin without needing to thread and re-thread your machine. It is on my Christmas list and I have my fingers crossed that I’ll be able to give you a thorough review soon! Where have you been all my life? This little contraption may not have made it to the essentials list, but it is such a handy little tool. When making straps, this small, but useful contraption will turn your fabric right-side out with ease. The Dritz version in the picture comes with three different sizes and for around $6 you can avoid the many headaches caused by turning tubes out without one. A self-healing rotary mat is helpful when squaring, measuring, or cutting fabric. It protects the surface underneath while the self-healing aspect keeps the mat in tip-top shape. With lines running both parallel and perpendicular to each other, it is easy to keep everything straight. When combined with the speed and efficiency of a rotary cutter, you can whip out your pattern in no time. The ultimate accompaniment to the rotary mat is the rotary cutter. The retractable cutter resembles a pizza wheel and uses the same cutting motion. It is the perfect companion tool to the rotary mat and allows you to cut multiple layers of fabric with ease. When you are finished using it, simply hit the little orange button and the blade returns to the safety position. This is most certainly not a “necessity”, but if you purchased a thread multi-pack and love for things to be orderly, a thread organizer is nice to have. If you have a touch of OCD, like myself, you will find great enjoyment in organizing your threads by color. Of course that is all well and good until you purchase a new color and all of your notches are already filled. *Insert face palm! Regardless, having all of your thread visible makes it easier to see what you have on hand when starting a new project and it’s really pretty too! There are few things more beautiful in sewing than hand embroidery. If you’re not ready to make the investment of a home embroidery machine or you simply love the look of the delicate hand designs, a few hoops in multiple sizes will start you off on the right foot. These hoops are rather inexpensive so it’s an easy investment piece. Don’t forget to grab a few embroidery needles and thread/floss (not your sewing machine thread!). It took me awhile to get on the “snap” train. For starters, I purchased a bubble pattern that didn’t include snaps or buttons in the crotch area and figured they weren’t really necessary. Rookie mistake. Unless you plan on taking the entire outfit off of your baby or toddler each time you change their diaper, I recommend adding some kind of enclosure around the legs and crotch area. I was a little intimidated by the snap pliers at first and opted to use buttons instead, but once you get the hang of it, these are much faster to add-on and to undo when changing. What are your favorite sewing tools? Are there any that we missed? We’d love to hear about it in the comments section below!